Colonel Richard Graham, former Commanding Officer of Strategic Reconnaissance Squadron 1 and the 9th Strategic Reconnaissance Wing, will be delivering a keynote lecture at Airventure 2016 the 24th and 25th of July. Graham, of Pennsylvania and Texas, was a pilot with the legendary 555th Tactical Fighter Squadron during the Vietnam War, and after combat tour of duty, transferred to the Strategic Air Command to fly the SR-71 Blackbird. He was assigned to Detachment 1 and reported to Kadena AFB in Okinawa for his check flight as Check Ride #291 in tail number 961 on September 22, 1975. He executed multiple missions, including the first over the Barents Sea, in seven different airframes, including nine as pilot of Habu #972. The #972 would, under other pilots, record the fastest crossing of the Atlantic Ocean (1hr 54min) and the fastest crossing of the United States (1hr 7min), securing itself as the fastest air breathing transoceanic and transcontinental aircraft in history. Graham, in 1976, was assigned to flying the Blackbird with Detachment IV out of Mildenhall England, then was designated Instructor Pilot and Chief of Standardization and Evaluation. In 1979, he was promoted to Lt. Colonel and awarded command of the 1st Strategic Reconnaissance Squadron, based at Mildenhall. Following a two year hitch, he enrolled at the Air War College, and after graduation, was named Program Element Monitor for the Air Force Research and Development Directorate at the Pentagon. In this capacity, he managed the finances and budgets for the secret “Black World” reconnaissance program. During his time assigned to the Pentagon, Graham lobbied as an advocate for continuing the SR-71 project at a time when the Air Force was increasingly relying on satellites for intelligence. 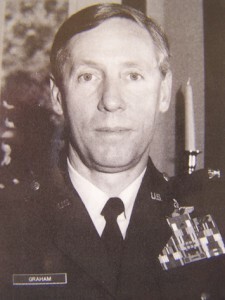 Recognized as one of the Blackbird’s leading proponents, he was promoted to Commander of Strategic Reconnaissance Wing 9 in 1987 and led the unit from Beale AFB until 1988. He would be the third to last commander of the unit, which was disbanded in 1990. 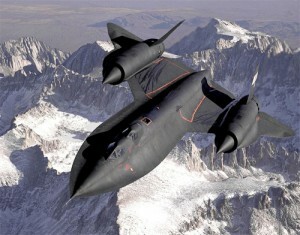 The last airshow at which the illustrious SR-71 would appear, was Airventure at Oshkosh on July 31, 1989. On March 6, the following year, the era of the Blackbird came to an end with the last flight of #972 from Los Angeles to Dulles Airport outside Washingon D.C. Although three airframes were to be reactivated for research by NASA, the super secret fastest plane on Earth, was decommissioned and never flown on active duty by the Air Force again. Habu #961, the tail number in which Graham received his check flight, was disassembled and hauled to the Kansas Cosmosphere for reconstruction and display at the popular Hutchinson space museum. Habu #972, having set speed record that remain on the books today, was towed from Dulles Airport at Chantilly, Virginia, and placed on exhibition at the Smithsonian’s Udvar-Hazy Air And Space Museum. Colonel Graham was kind enough to sign for me my SR-71 model and a copy of his autobiography, “SR-71 Revealed: The Inside Story.” He personalized his signature with a dedication that read “to the biggest fan of the SR-71.” I don’t know if I’m the biggest, but I am proud to have the autographs of eight Habu pilots in my model display and a total of 75 signatures of SR-71 pilots and RSOs in my collection.